The Barrel Oven can be built almost entirely out of recycled, re-sourced and local materials. At its center is a metal barrel, of which there are many you can pick up second hand. One or more racks to bake on are constructed inside and a door is fashioned at one end. This gives you a capacity to bake eight to ten 2 lb (1 kg) loaves of bread, four 12” (30 cm) pizzas. When cooking in the Barrel Oven, a fire is built in the firebox located beneath the barrel. The fire hits the bottom and wraps tightly around the barrel as it travels through the carefully constructed space between the metal barrel and the surrounding bricks. This extended contact between the fire and the metal concentrates the heat for cooking inside the barrel and is what allows the Barrel Oven to heat up so fast. 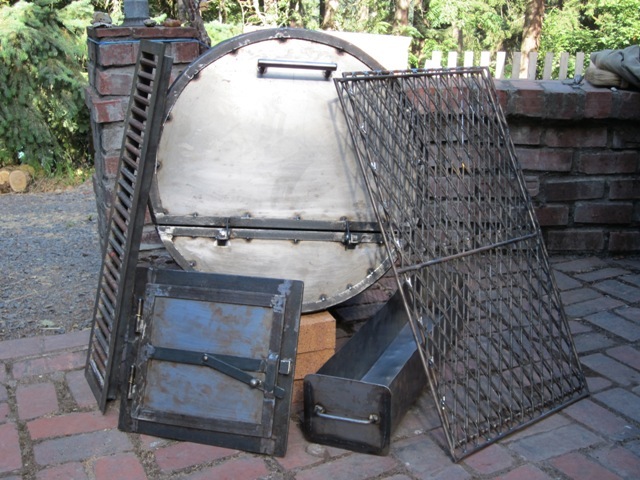 Building a Barrel Oven is a manageable project for people new to construction. It is very satisfying to begin with nothing and then create something which becomes a gathering place for good meals and good times. It is also ideal for those exploring natural building as it offers experiences building a foundation, making and laying your own bricks, and constructing a simple roof structure — all on a small scale. We are currently building the foundations of our oven at the moment. Below is a community group building an oven.